The Dinosaur Splashsuit is great fun for toddlers to 5 year olds. This kids rain suit will keep them clean and dry – whatever muck they get into – and can be worn with or without clothes. – Waterproof, lightweight and breathable shell. – Internal lining throughout body for comfort . – Easy-to-use chunky zip, with neck protector. – Elasticated wrists and cuffs, to fit over boots. – Easy to wipe clean at the end of the day. – Fitted hood with Fun Dinosaur Spikes. Made from 210T polyester with a PA coating to ensure they are light, breathable and waterproof. Ecotex tested to ensure complete fabric safety. Trouble Choosing a Size? See Our Size Guide. The Splashsuits Dinosaur Kids Rain Suit, Kids Waterproof & Waterproof Onesie. The perfect boys rain suit, boys splash suit, boys puddle suit, boys waterproof. Splashsuits™ are have been designed for the unique body shape of toddlers and children. 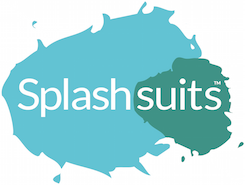 Splashsuits™ are also lined for comfort, which to stop stickiness on warmer days. Splashsuits™ zips are separately lined to stop leakage, with a neck protecter to stop catching. Splashsuits™ fabrics and dyes are completely free from chemicals that may harm children.